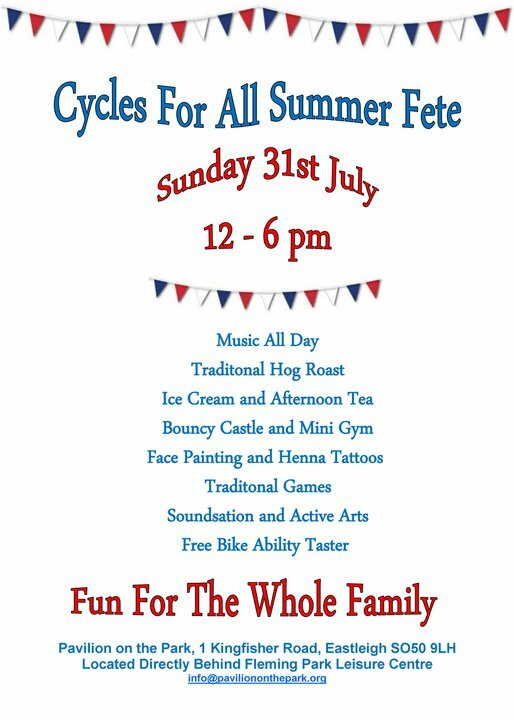 Description: This summer on Sunday 31st July Cycles for All will be hosting the perfect family day out with our Traditional Summer Fete with hog roast, face painting, bouncy castles and a sponsored cycle challenge. Cycles For All is run by a local community charity that provides accessible cycles to those whose ability to use their limbs, balance and learn new skills is challenged. The project based at Eastleigh’s Pavilion on the Park has been successful in giving a wide range of people a chance to use a cycle, often for the first time, and gain new independence since it began in January this year. The project is aiming to raise funds to add a new adult hand cycle to its fleet of 12 bikes, enabling the project to reach more people. The day will begin at 12 noon on Sunday the 31st July at Pavilion on the Park, 1 Kingfisher Road, located directly behind Fleming Park Leisure Centre. The day finishes with a presentation from the Mayor of Eastleigh at 5.30pm.